In the recent Surface event that was held by the tech giant Microsoft, the company introduced a new app that will allow Android users to mirror any app to the Windows computer. The mirroring app is an attempt to integrate the mobile phone ecosystem with Windows. Well, in the recent Surface event that was held by Microsoft, the company introduced a new app that will allow Android users to mirror any app to the Windows 10 computer. The mirroring app is known as Your Phone, and it’s an attempt to integrate the mobile phone ecosystem with Windows. The tech giant, Microsoft is now rolling out the new app for all Windows 10 users with the new Windows 10 October update. The app eventually allows users to access their phone’s content right from the Windows 10 computer itself. Two months have passed since the existence and development of ‘Your Phone‘ was revealed. An application which is developed directly by the tech giant Microsoft, under the objective of achieving the best content manager of Android for PC. At that time the vague promise is that the program would soon be released. Now, as we already told you guys that the tech giant Microsoft has finally set an official date for its launch and it would be much closer than expected. 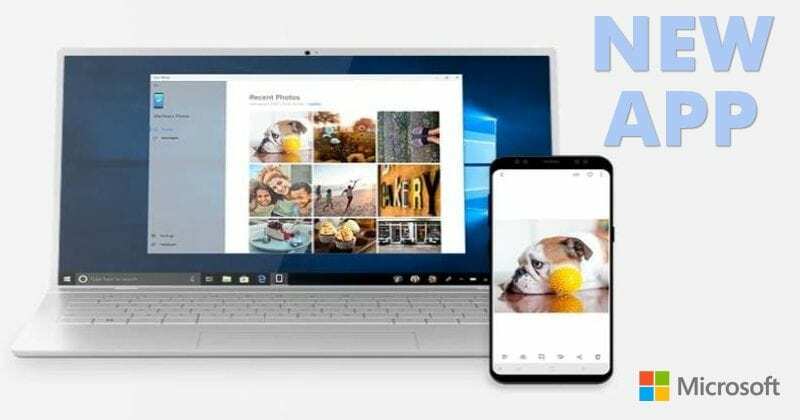 Through a series of publications on its official blog the company, of course, the tech giant Microsoft, Your Phone application was one of the novelties included in the October 2019 update for Windows, as we told earlier. In this first phase, the app will be compatible only with phones that run Android 7.0 and up. There is no information about future updates that expand that spectrum or anything about iOS. But still millions of users would have the opportunity to try Your Phone app on their Android device once the tech giant it is launched. Even the tech giant Microsoft’s friends had the point of releasing a demonstration video on their YouTube channel to see how it works. The main focus of the app will be on photos and text messages within the smartphone. But its absolute integration with the Windows suite is its main attraction. along with the possibility of doing app mirroring, and see the contents of the Android screen on the PC screen. So, what do you think about this? Simply share all your views and thoughts in the comment section below.